Great educational institutions have faculties and academics as their biggest assets. The most important element which plays a critical role in IIM Udaipur’s objective of imparting quality education is the faculty team at the institute. The selection process of faculty at IIMU is designed to consistently attract the best of the teaching and research talents from the PhD programmes of India and abroad. While putting together the faculty team, the practitioners and academicians are tested for excellent potential in their respective domains. Prominent faculties from the top B-Schools of India like IIMA, IIMB, IIMC etc. also visit to bolster the academic wealth of IIMU. IIM Udaipur has over 22 permanent and over 30 visiting core faculties contributing to a faculty to student ratio of 1:5.5. This ensures personalized attention to the students resulting in their better learning, grooming and hence forth, transformation. The number of research and working papers published in the journals across the globe within just three years on inception reflect that some of the best management research work is carried out in the IIMU campus. The faculty incorporates best pedagogical means and practices comparable to those followed in the best B-Schools of world in the development of students. The craft of teaching and the methodologies of deliveries are complemented by the well-equipped infrastructure of the institute and technologies like research tools, digital library platforms, latest journals and Bloomberg Financial analysis & research lab. The current faculty force includes professors, researchers and consultants with significant experiences in the field of teaching. Senior industry professionals also join the permanent faculty for lecturing the students about their business acumen. Intellectual entrepreneurs who have created enterprises executing business strategies blending with ideas also contribute in the learning process of students in sync with another pillar of the institute, entrepreneurship. The academic curriculum of the institute is overseen by Prof. Jahar Saha, Former Director – IIM Ahmedabad. The visiting faculty of IIMU has prominent names on the likes of Prof. Jagdeep S. Chokkar, Former Dean – IIM Ahmedabad and Co-Founder of Association of Democratic Rights Foundation (ADR) which recently bagged the IBN and NDTV Indian of the Year Awards. Other pioneers in their own rights of different management domains like Prof. Ramesh Bhat (IIMA), Prof. L. S. Murthy (IIMB), Prof. Sunil Unny Guptan (IIMA) and Prof. Janat Shah, Director – IIMU join the list of faculties teaching at the institute. Each faculty of the institute is aligned to the goals, vision and values of the institute and dedicatedly prepares the students for responsible positions they would take up in various management roles. All faculty members are always approachable and their guidance and support is available to students and alumni even outside the classrooms for tutorials, live projects, internships, placements preparation, job guidance and clubs & committees events. IIMU possesses the potential of best teaching minds and has a long term aim to become the hub of management research in the country. 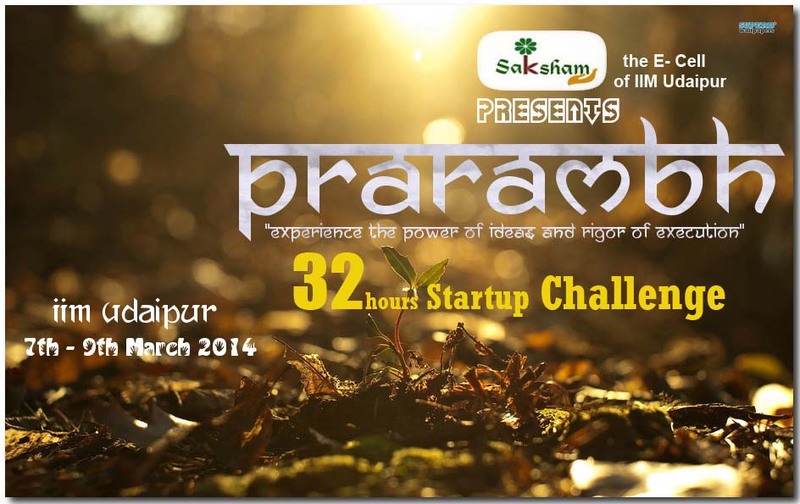 Saksham – The E-Cell of IIMU presents Prarambh! Entrepreneurship for IIM Udaipur is a value which it endeavors to inculcate in its students and community as we progress. 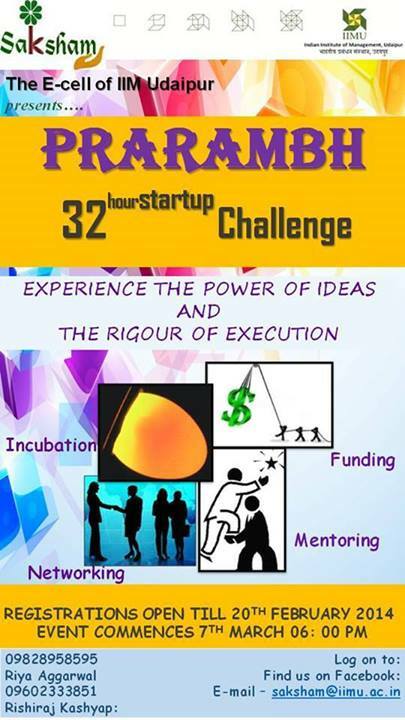 With this thought in mind, Saksham – The Entrepreneurship Club of IIMU, launches its first edition of Prarambh – The 32 hour Challenge in Udaipur. The idea of the start-up platform is to bring together entrepreneurs of different backgrounds, including software developers, marketers, designers, enthusiasts to develop synergies and facilitate the translation of ideas to reality. The participants that attend have to pitch their ideas, the pitches are whittled down to the top ideas and then teams can be formed around these ideas. Teams work on their plans continuously for 32 hours with guidance from the mentors to create a working model of their idea or a Minimum Viable Product. Finally, the weekend culminates with demonstrations in front of judges and potential investors who decide the winners. Visit http://www.facebook.com/Saksham.Prarambh and http://www.iimu.ac.in/prarambh for more details!